Ms. Virginia (Ginny) Esposito led the national creation of resources to understand and support family philanthropy. Both in her role at the Council on Foundations, and as founding president and CEO of the National Center on Family Philanthropy, she has been a wise counselor, observer, and friend to the similar work underway in Michigan. Ms. Esposito served as the first and only Frey Foundation Visiting Scholar in Family Philanthropy at the Johnson Center for Philanthropy at Grand Valley State University, helping to launch the new chair as the university completed its initial search. Ms. Esposito offers an excellent national perspective on Michigan’s philanthropic culture and specific projects around the state. Ms. Ginny Esposito talks about her career in philanthropy. Ms. Ginny Esposito talks about the qualities of Michigan leaders. Ms. Ginny Esposito talks about the qualities of servant leadership ethic. Ms. Ginny Esposito talks about how Michigan is often regarded as the leader in philanthropic public policy. Ms. Ginny Esposito talks about the inevitable generational leadership change in Michigan. Ms. Ginny Esposito received a Bachelor of the Arts degree from Mary Washington College in Virginia. She was also selected as a fellow for the Institute of Educational Leadership, and earned a certificate in executive management from Yale University, School of Management. Growing up with six siblings and a military father, Ms. Esposito knew that even if there wasn’t much discretionary cash, her family would participate in pledges and volunteer opportunities to better their community. This instilled the value of philanthropy in her early on, and as a senior in high school, she chaired a school-wide effort to get students involved in volunteer activities. While she did not consider the nonprofit field as a career choice until later, these experiences were valuable in building her interest and her passion. In 1980, Ms. Esposito started her exploration into the world of professional philanthropy and nonprofit work at the Council on Foundations. She joined the council’s staff just after its move from New York to Washington, D.C., and described the organization as “unpacking boxes and trying to organize itself.” It was during this move that Ms. Esposito came across disused file cabinets that contained the council’s files on area associations and requested to focus her efforts on the associations contained within them. She was granted approval and became the first staff person dedicated to area associations. Ms. Esposito later moved on to grantmaker education, which put her in contact with many key figures in the field, including Dr. Paul Ylvisaker. Jim Joseph*, president of the Council on Foundations at that time, brought Dr. Ylvisaker on as a special consultant to education, and he acted as a mentor for Ms. Esposito for ten years. This time spent as a grantmaker educator helped her become more and more aware of what would eventually become the base of her career – family philanthropy. Additionally, she acted as vice president for the Council on Foundations. Ms. Esposito describes family philanthropy as a “perfect coming together” of how much she valued family and how much she cared about the field of philanthropy. This interest in family philanthropy and the stories she heard from its practitioners, led Ms. Esposito to recognize the need for a central, national organization. The infrastructure organization that she envisioned would have the aim of enhancing and guiding the development of family philanthropy, as well as representing it in various forms. Thus, the seeds for the National Center on Family Philanthropy (NCFP) were planted. *Jim Joseph was appointed by President Clinton to serve as ambassador to South Africa. He held the title of ambassador after this presidency at the Council on Foundations. Ms. Esposito pursued the creation of NCFP despite political adversity from those who felt that highlighting family philanthropy could be harmful to other parts of the sector. Ms. Esposito handled much of the groundwork required to start the center, including conducting personal interviews and focus groups and drafting all of the concept papers. The NCFP officially came to life on September 3, 1997. It was only very near to the end of the creation of the NCFP that Ms. Esposito thought about her own stake in it, and even then, required convincing by her committee to take the position of founding president. Ultimately, Ms. Esposito identified her passion for the work as the primary factor in overcoming her hesitancy for the position, and has acted as the founding president since 1997. Ms. Esposito was also an active public speaker on the topic of family philanthropy. To name a few of her many public engagements, Ms. Esposito presented the closing remarks at the first National Symposium on the Value of Family Philanthropy in 2008, spoke alongside Bill Gates Sr. at the Family Philanthropy Day event in 2010, and presented at the Dorothy A. Johnson Center for Philanthropy National Summit on Family Philanthropy in 2011. In addition, Ms. Esposito served as the first Frey Foundation Visiting Scholar in Family Philanthropy at the Johnson Center from 2009 to 2013. Ms. Esposito’s volunteer involvement continued in addition to these many responsibilities. Presently, she serves on Great Nonprofits’ board and on Independent Sector’s ethics and accountability committee. Notable past involvements include acting as a board member of the Better Business Bureau’s Wise Giving Alliance from 2002 to 2008, serving on the executive committee for the Forum of Regional Associations of Grantmakers’ New Ventures in Philanthropy project, serving on the board of directors of the National Charities Information Bureau in New York, and as a member on the National Commission on Civic Investment in Public Education (1). Ms. Esposito was interviewed regarding her insights and experiences in working with Michigan’s philanthropic community and the Our State of Generosity (OSoG) partners. The following are selected quotations from her interview specifically related to the five organizing themes of the OSoG project. 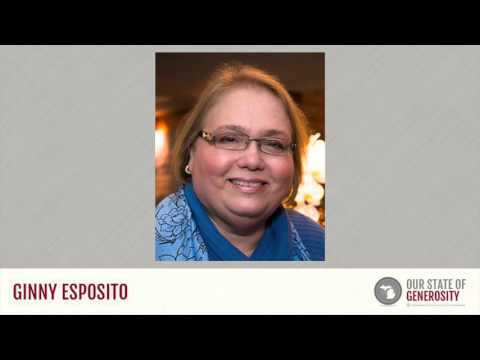 (1) “Symposium speaker: Virginia Esposito”. Center for Nonprofits University of Wisconsin-Madison. n.d. Web. 14 May 2014.